The original Apple logo, designed by Ron Wayne. April 1, 1976: The Apple Computer Company gets its start as founders Steve Jobs, Steve Wozniak and Ronald Wayne set out to sell the $666 Apple-1 computer. Apple will not officially become a corporation until January 3 the following year. By that time, Wayne is no longer a part of the business. Apple’s initial ambitions were quite modest. Wozniak started working on the Apple-1 as a hobby, with no goal beyond showing it off to peers at the local Homebrew Computer Club. “I did this computer … to show the people at Homebrew that it was possible to build a very affordable computer — a real computer you could program for the price of the Altair — with just a few chips,” Wozniak recalled in his autobiography, iWoz: Computer Geek to Cult Icon: How I Invented the Personal Computer, Co-Founded Apple, and Had Fun Doing It. Jobs convinced Woz that they would find more success building and selling the Apple-1 rather than giving away the designs. This led to Jobs, Woz and the older Wayne — who the Steves met at pioneering video game and computer company Atari — going into business together. 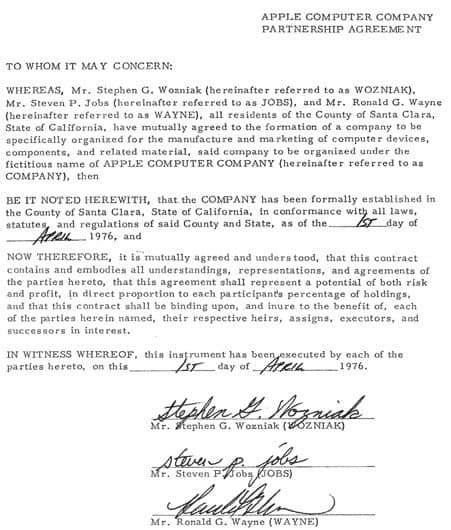 Jobs and Wozniak were the main drivers behind Apple. They each received a 45 percent stake in the new company, while Wayne held the remaining 10 percent. Less than two weeks after the company’s founding, Wayne cashed in his Apple shares for $800. He eventually received an additional $1,500 to seal the deal. By early 1977, Apple was ready to release its breakthrough Apple II. And the company lined up venture funding to fuel expansion far beyond its humble origins. When Apple went public in 1980, both Woz and Jobs became instant multimillionaires. Today, Apple is a company that’s approaching $1 trillion in value — having already hit that milestone once. Times have certainly changed!